The Czech Republic has many interesting and historically important destinations in addition to its capital, Prague. Many of these destinations can be easily reached and toured in a day, making for interesting day trips from the city. In addition to having the opportunity to see many historical castles, chateaux, towns and cities, these trips afford you the chance to see some of the Czech Republic's beautiful countryside and take in more local flavor. Here are some of my favorite places. Kutna Hora is a beautiful medieval, mostly Gothic, city, with many historical landmarks revealing its rich silver mining past. It is one of my favorite places and is highly recommended. In addition to the historical structures, the town itself offers stunning views of its small valley from the “hora” (small mountain). There is also a wonderful art gallery there and a good place to have lunch. 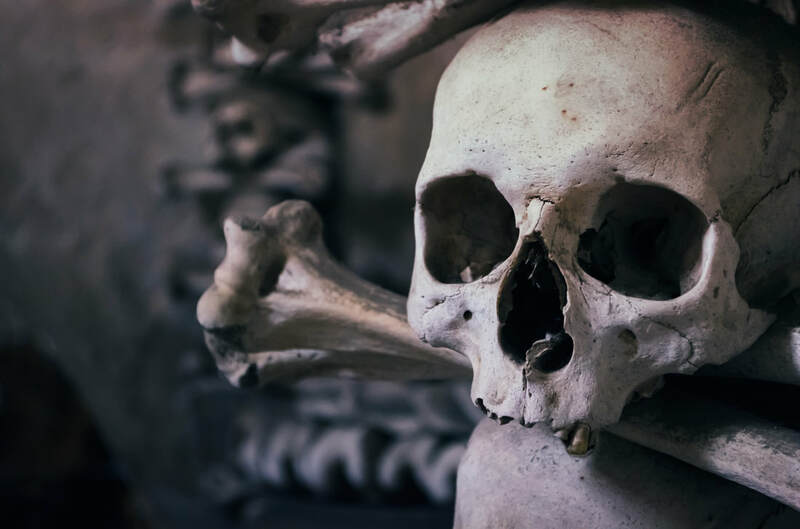 This photo is from Kutna Hora’s infamous “Bone Church,” where the remains of 40,000 people are arranged into "pleasing patterns." I offer day trips to Kutna Hora by train or with a car and driver service. Contact me for more information. Built in the 14th century by King Charles IV as a place of safe-keeping for reliquaries and the crown jewels, this fairytale-like castle rises high on a hill near the Berounka River not far from Prague. The heart of the castle is the Chapel of the Holy Cross, with walls covered by semi-precious stones. Access to this part of the castle is limited due to the need to maintain certain atmospheric conditions, so check listings; however, the exterior and other interior spaces are regularly available for tours. Karlštejn is about a 30-40 minute car or train ride from Prague (trains leave regularly from the main train station, Hlavní Nádraží). Undoubtedly the most famous owner of the Konopíště Castle over its many centuries of existence (since the 14th) was the archduke Frantisek (Franz) Ferdinand d'Este, a successor to the Austro-Hungarian throne whose assassination in Sarajevo in 1914 became a pretext of World War I. Konopíště is about 30 minutes from Prague by car. Just 35 kilometers north of Prague, this Renaissance castle belongs to the Lobkowicz family and features one of the finest private art collections in Europe. Across the street from the castle, you can see the birthplace of Czech composer Antonín Dvořák. A train ride from Masarykovo Nádraží to Nelahozeves takes about 30 minutes. Enter only with private guided tours booked in advance.